What is it? Do I need it? How do I buy it? An increasing number of carers are making the decision to become self-employed. Working for yourself can give a level of flexibility and job satisfaction much greater than that offered by traditional employee roles. You can choose who you work for and when you work, with the potential to improve work life balance. However, working as a self-employed carer doesn’t come without risks, such as your liability if there are errors in administering medication or causing injury whilst caring for somebody. In these situations, you can face a compensation claim and damage to your reputation. Public liability Insurance for Carers (Carers Insurance) is a way of covering against these risks. Nobody enjoys shopping for insurance, there can be endless forms to complete, lots of information to take in and an overwhelming choice of companies. This is no different when looking for Carers Insurance. Cover -You may have one, full-time client with specialist needs, or several clients requiring various levels of care. You can be doing different tasks from one day to the next. When looking at policies, think about all the tasks you will be doing (e.g. preparing food, lifting clients, administering medication, carrying out domestic duties) and make sure they are included in the cover. Will you be in their home? Customer Service – It’s also important to feel reassured that the company you choose will provide you with good customer service and support when required. Have a look at their policy wording, is it easy to understand what you are actually covered for, are any important exclusions made clear and obvious? Is their website and quote process easy to use? If possible look for company reviews, is there positive feedback from other people in your position? Costs – As well as looking at premiums, keep an eye out for various excesses. Will you need to pay anything in the event of a claim? Are there charges for making changes to the policy or cancelling? Doing a bit of research before buying may be a little time consuming but it’s worth it. Any good insurer will happily spend time understanding your requirements and let you know if their policy will provide the cover you want. 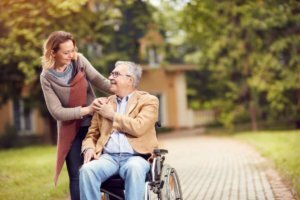 Blue Badge Carers Insurance keep everything as simple and straightforward as possible whilst making sure our policies suit the needs of our customers. Our quote process is quick and easy either online or over the phone with an advisor who can answer any questions you may have. To find out more about our carers insurance call us on 01730 233 101 or go to our website.